The most famous Prague markets are the Christmas markets and Easter markets, when the city fills with festive delights. Aside from these, Prague has two permanent markets, a farmers' market, street vendors and pop-up markets. The main permanent markets in Prague are Havel's Market (Havelske trziste) in the city centre, and Prague Market (Prazska trznice), which has less appeal and is located a metro/tram ride away. Pop-up markets appear frequently throughout the year at the Old Town Square, Wenceslas Square, Republic Square and on Kampa Island in the Lesser Town. 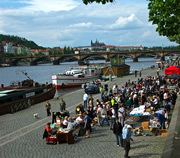 And street vendors sell arts and crafts on Charles Bridge and alongside the river, most notably by Rudolfinum. Address: Havelska Street, Prague 1. Metro: Mustek (lines A & B). Open: Daily 06:00-18:30. 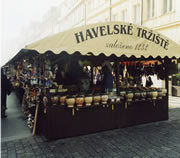 Havel's Market (Havelske trziste) is the permanent market in the city centre. Open all year round, it is popular with locals and tourists alike. 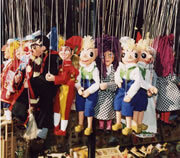 Stalls stock arts and crafts, wooden toys and puppets, flowers, leather goods, ceramics, and fruits and vegetables. The market is a good place to buy tourist souvenirs. Havel's Market is located off Melantrichova street, the main pedestrian route linking Wenceslas Square with the Old Town Square. Address: River embankment, Palackeho náměstí, Prague 2. Metro: Karlovo náměstí (line B). Tram stop: Palackeho náměstí (trams 2,3,4,7,10,16,17,21). The Farmers' Market at Náplavka attracts mostly Czech people, although the number of tourists is growing. It is situated on the New Town side of the river and is best reached via a pleasant 20-minute stroll along the river from the city centre. A varied collection of vendors sell seasonal fruits and vegetables, including organic produce, artisan bread and pastries, meats, cheeses, beers, wines and spirits, plus ceramic goods. Address: Bubenské nábřeží, Holešovice, Prague 7. Metro: Vltavská (line C). Trams: 1,12,25. Prague's largest outdoor market is located just outside the city centre and is open all year round. 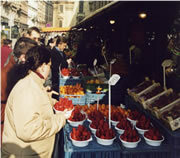 Prague Market is a network of small kiosks selling electrical equipment, clothes and accessories, and fruit and vegetables. Prague Market is aimed at local Czechs and is fairly run down. This, combined with its location, means it offers little appeal to most tourists. The most popular markets in Prague are undoubtedly the Christmas markets and Easter markets, which are held at the Old Town Square and Wenceslas Square.